A GRAND film for a gala opening night – Outlaw King, the Scottish feature by David Mackenzie (High or Hell Water) and starring Hollywood pin-up Chris Pine went down well here at the Toronto Film Festival. Director David Mackenzie introduced the film at its world premiere and welcomed many of the stars to the stage – some in kilts. 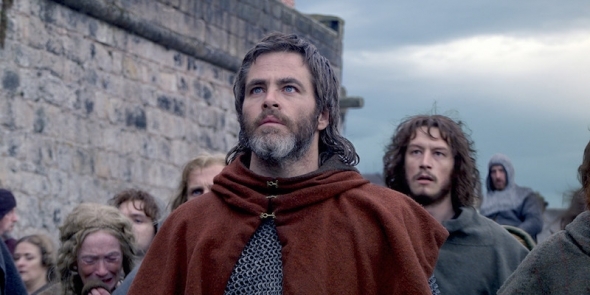 Epic and sweeping, Mackenzie’s film is really the history of Robert Bruce (Chris Pine) final resistance to English sovereignty. Sumptuous cinematography, a believable hero in Bruce, a powerful romance with an English Queen and stirring fighting action scenes give the film much to recommend it. Perhaps the English are caricatured and limp in comparison but this is well worth a watch and if you are a proud Scot this will probably stir something quite, deep and powerful about identity in the wake of Brexit. The big question might well be how much will this film help stir nationalist feelings north of the border and will it gift Scottish leader Nicola Sturgeon, of the SNP, a boost as she considers IndyRef2 – and a second question asking the Scottish people whether they want to break off the Union and go it alone. Chances are that re-entry into Europe might the possible prize and a distinct two fingers at the Brexiteers in England. Does this have enough quality to carry it through to Oscars season, yes, quite probably with a best picture nomination more than likely. Earlier, the audience at the Prince of Wales Theatre in Toronto heard a short address from TIFF CEO and departing chief, Piers Handling. Festivalgoers saw a short film charting the rise of TIFF and extolling Handling’s efforts in putting Canadian cinema on the global map. Both Deepa Mehta and Mira Nair get a quote or two in the short doc. The audience also heard from incoming chief and present artistic director, Cameron Bailey. Earlier, acv saw ‘Non-fiction’ – the film from French auteur, Olivier Assayas and Korean master Hang Sang-soo’s haunting ‘Hotel by the river‘. Read more about acv at the Toronto International Film Festival soon!